It's Mariah's world and we're all just living in it. 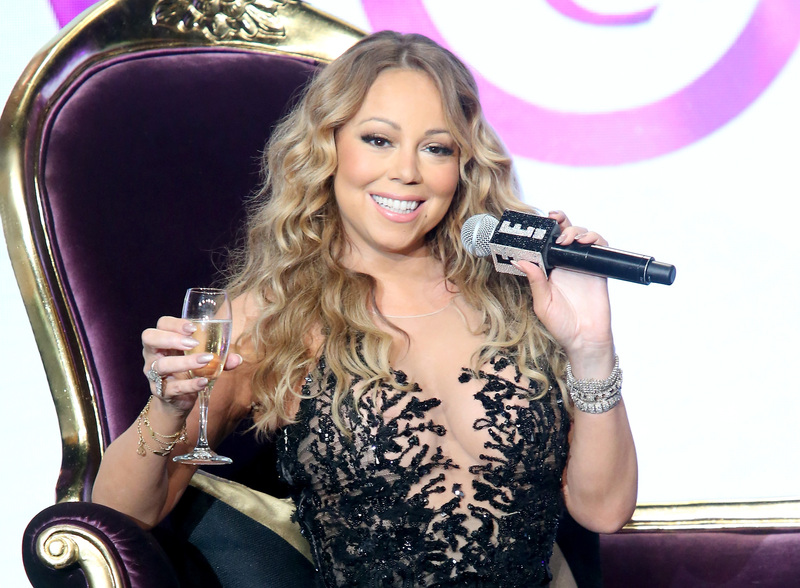 Quite literally, since Mariah Carey's eight-part docuseries, Mariah's World , premiering December 4 on E!, promises to take us inside the ridiculous fabulous daily life of the pop diva. It's a life that I imagine is filled with champagne wishes (Dom Perignon, of course) and caviar dreams and perfect lighting. Carey already knows that we're living for the footage. Heck, she made that abundantly clear in the first trailer for Mariah's World , which has her drinking water like a queen, making jokes about Noah's ark, and sliding down a slide in the most Mariah way ever. But, while this reality show will give us a behind-the-scenes look at the real Mariah, this isn't the first time we're getting a glimpse of the star. In fact, there are a whole lot of things that we already know about her. Chalk this up to the fact that Carey's been a pop culture staple since she hit the scene in 1990, her self-titled debut wowing us with her five octave vocal range. Since then she's taken over Christmas with "All I Want For Christmas" and taught us how to perfectly shade all our rivals. While she's bound to give us many more moments that we'll be talking about for years to come, it's imperative that we don't forget what she's already given us. It's the footage we've been living for for decades now. We all know this video where Carey gets to play a Bond girl who has no problem taking care of herself. The honey-toned clip was her first time playing the provocateur. She even gave us her own Dr. No moment, pulling an Ursula Andress as she emerges from the water. Carey poked fun at herself in this MTV Video Music Awards bit that had her taking the stage in the same "one of a kind" dress as her perceived rival Whitney Houston. Not to be outdone, she came prepared to alter her dress to make sure it truly was a one of a kind, ripping off her skirt while shouting, "Try it on me." That same year, the two would team up for "When You Believe" from the animated film, The Prince Of Egypt. This over five-minute long video, directed by Brett Ratner, had Carey taking on herself. But what makes this clip stand out even more is the fact that we know all the behind-the-scenes dish thanks to MTV's series Making The Video. It was one of the most expensive videos ever made, coming in at $2.5 million, but that scene where Mariah takes on a brunette version of herself named Bianca is priceless. Glitter was not a hit, far from it. But, as the New York Times made clear in its review, it is "unintentionally funny," which is why we still talk about it today. It's become shorthand for a failed venture, but it didn't stop Carey from trying her hand at acting again. She's since been in Precious, The Butler and Empire (all Lee Daniels projects) to much better reviews. As a prelude to her reality show, I suggest re-watching her episode of Cribs, which is totally bonkers. She gives a now notorious tour of her New York penthouse by working out on a treadmill in stilettos, putting her dog in her dryer, and jumping into a bathtub full of bubbles — while wearing a bodysuit, as she would later reveal. Carey is not going to let anyone steal her spotlight, especially her backup singers. So when one of them seemed to be doing just that during a performance on Good Morning America, she shut it down real quick. "Stop singing my part, baby," she sang during the breakdown of "Touch My Body." Awkward, but memorable. Carey doesn't do anything small, so, when she had her twins, Monroe and Moroccan, she started a website and a hashtag, Dem Babies that would be the home base for all photos of her adorable little ones. Remember when Carey was a judge on American Idol? Neither do I, really. What I do remember, though, is her fight with fellow judge Nicki Minaj. It happened during auditions in North Carolina, when Minaj felt Carey was being disrespectful. "Say one more disrespectful thing to me, if you say one more disrespectful thing to me — off with your head!" Minaj said before accusing the singer of calling her "insecure." Carey accuses her of having "a little baby fit." That was the title of her 14th album. Or, more completely, the title was, Me. I Am Mariah... The Elusive Chanteuse, and it was inspired by a drawing a young Mariah drew of herself. It was the "first and only self portrait" Carey said she ever drew. But the title was the singer making it clear that no matter how much you knew about her, there was still so much to learn. Not that she was going to give everything away. How elusive of her. When recently asked about Jennifer Lopez on Watch What Happens Live! Carey's response was a simple four-words: "I don't know her." It soon took the internet by storm because, hello, how could she not? But it wasn't the first time Carey had used this excuse to totally obliterate her competition. In the early 2000s, when Carey was asked about Beyoncé, she raved about her, but, when asked about J.Lo, she gave the same exact response with a big smile and shaking of the head. Turns out, Carey's forgetfulness is very pop star specific and always has been. Basically, over the years, Carey has been someone who can't help but make moments everywhere she goes. With the cameras now following her though, it's about time she made a few more.